Be careful what you wish for. With their after school junk business, best friends Sonny and Sam hope to find treasure in other people’s trash. But when cleaning out the old Stine house, they open a lockedbook that frees a supernatural nightmare-Slappy! Now, with the help of Sonny’s sister Sarah, they’re in a race against time to get the sinister dummy and all the creatures he’s brought to life back into the pages before he unleashes total pandemonium! 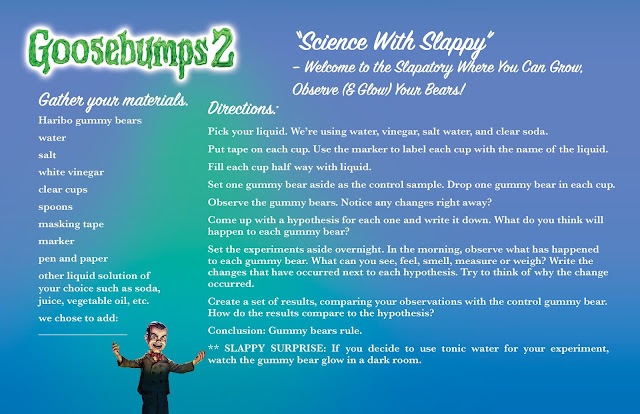 Besides a movie night, what about extending the fun with some fun science with Slappy? These would also make for fun homeschool science experiments. You could even pair up some of the books to make a fun mini-unit. Head to the "Slapatory" and grow, observe, and glow your gummy bears! Check out Slappy's take on the experiments too! Wouldn't these be great snow day activities when you just don't know quite what to do and it's too cold to go outside? Disclaimer: The information above was provided from Goosebumps 2, all opinions are my own.